I used my clipper card on Muni for the first time this month on April 4. I tagged my card when I entered the Muni on Evans St. at 3:35 pm. My clipper card transaction history shows “Threshold auto-load at a TransLink Device at 3:35 PM.. I have spoken to Clipper customer service and they verified that I tagged my card. When I off-boarded at Embarcadero station, the officer said I did not tag my card and that I added $20 value at 3:45 Pm and issued me a ticket for $103. I was riding on the Muni at 3:45PM after having swiped my card at Evans St. ten minutes earlier. My clipper card transaction history shows that at 3:35PM $20 in value was added to my card; however is does not show that the fare was deducted. Help! My citation review was denied even though I sent a copy of my clipper card transaction history along with the request for review. I tagged my card, my transaction history shows that. The Muni system failed to deduct my fare. I had a balance for $9 before the $20 was added!. I’d appreciate any advice and assistant. Saw this what looks to be ambient advertising piece on the L train today. Pretty good stuff. A cat hair vacuum I think? 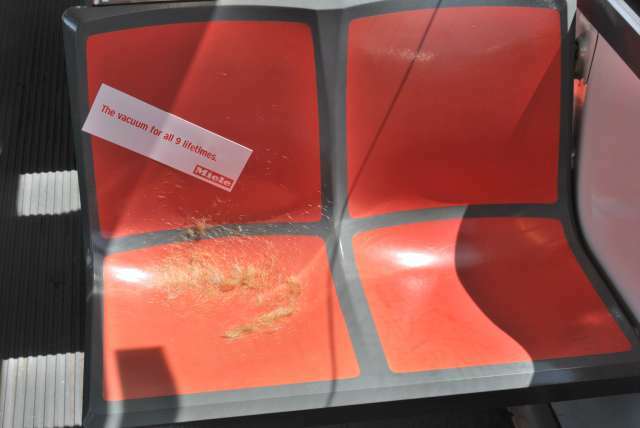 A real ad from Miele, or does this mark the return of juvenile guerilla ads on Muni? Helen describes the scene above. 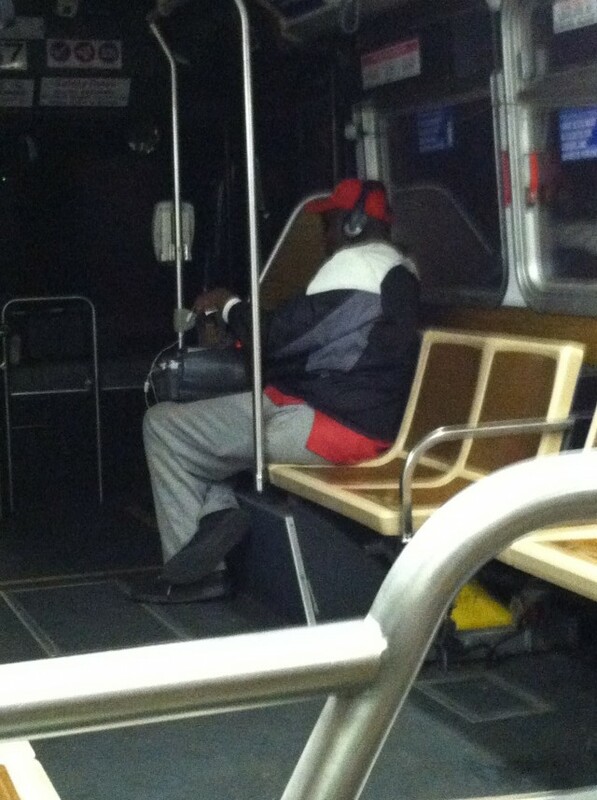 This guy was listening to his boombox with headphones on the 28. And jamming out. Hard. Ah, never mind. I give up. Helen dropped this one into our Diaries submission box. Now it’s your turn to share! 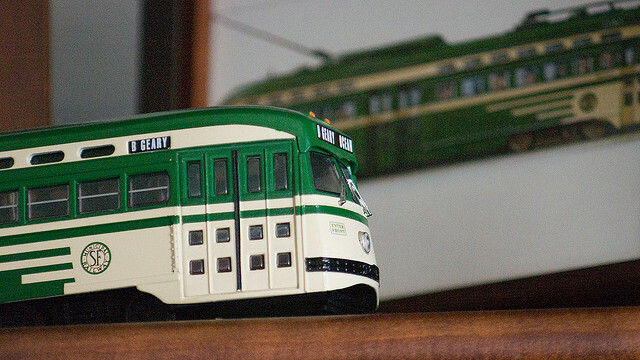 My mother’s most memorable Muni story is that she was taking me to the doctor on the old B Geary streetcar (I was still a baby.) As we neared our stop, she picked me up (I was wrapped in a blanket) and walked toward the open door. A gust of wind came through it and blew the blanket open, revealing I was barefoot. An old lady noticed me and said loudly, “That baby must be cold!” My mother then covered me back up and got off, saying nothing, but feeling quite embarrassed. Linda, who I met on the 22 #sfmuni just now — well, she wants organisation in this world. What do you want ? A reasonable request, however totally impossible. Esp. when it comes to Muni, amirite? 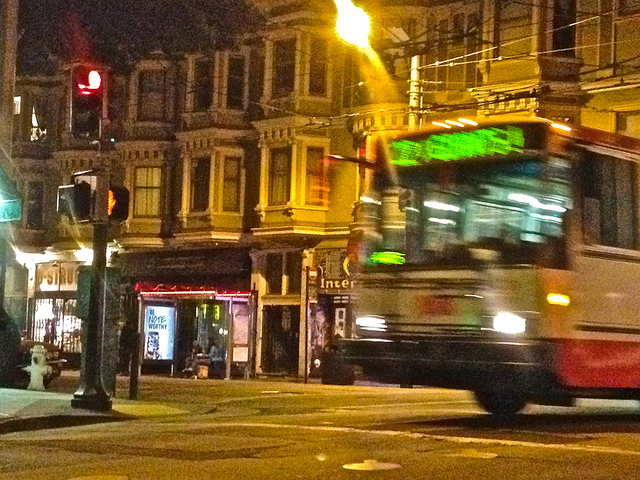 Reminder: You have until next Tuesday to submit your best Muni tales for the 100 Days, 100 Muni Stories feature. After that, we’ll consult with our pal Isaac Fitzgerald to determine who’s ball of yarn is the best — that one’ll be excerpted for bus ads on every Muni bus in town. Rad, we know. Does she know or doesn’t she? 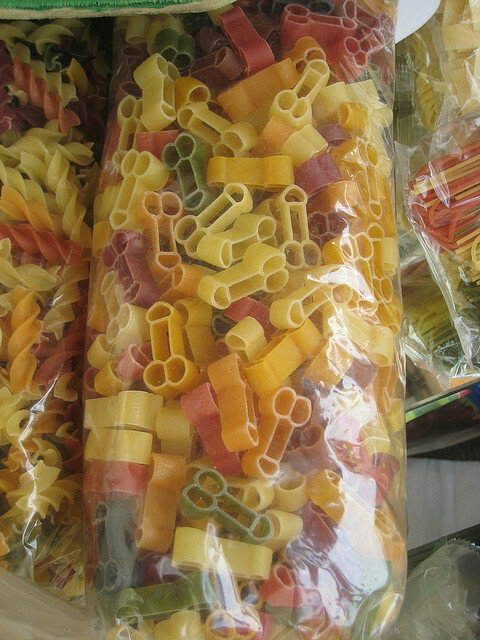 We hope this was a completely intentional purchase for a raging bachelorette party.